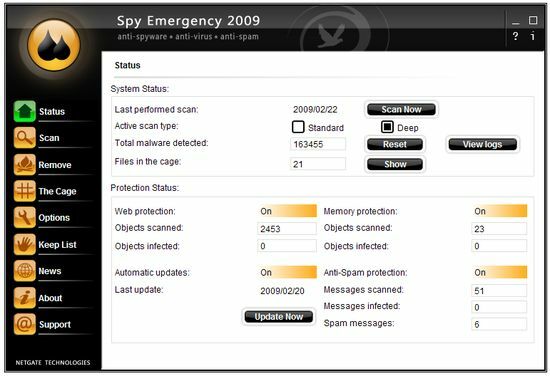 Spy Emergency is anti-spyware software that detects and cleans spyware, adware, trojan horses, keyloggers, cookies, dialers, spybots, trackware and other malware from your computer. Spy Emergency supports resident shields for real-time protection, automatic definitions database updates, built-in LSP stack repair technology and vx2 hijackers scan for better protection. It allows you to remove, quarantine or add to keep listed identified spyware. Works runs well, starts-up and updates is good. Needs a few runs to delete some and deletes others well. Has over 100,000 in defintion base. It's good but no spyweeper.